Igor Stokfiszewski is a literary critic, playwright and member of Krytyka Polityczna. He studied Polish literature at the University of Łódź and the Jagiellonian University in Kraków and, from 2001-2006, he edited the literary magazine Ha!art. He has worked as part of the Krytyka Polityczna editorial team in Warsaw and presently works with the international literary scholarship programmes of the Decius Villa in Kraków, the Teatr Nowy, Warsaw, the Teatr Łaźnia Nowa in Kraków and the Berlin Biennale. He is the author of Zwrot polityczny [Political Change] (Krytyka Polityczna, 2009), co-editor (with Piotr Marecki and Michał Witkowski) of Tekstylia. O “rocznikach siedemdziesiątych” [Textiles. The “Generation” Born in the Seventies”] (2002) and (with Piotr Marecki and Renata Serednicka) Ludzie, miasta. Literatura Białorusi, Niemiec, Polski i Ukrainy – ślady “nieistniejącego języka” [People, of the city. Belarussian, German, Polish and Ukrainian literatures – traces of “non-language”] (2008). 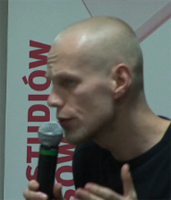 He has co-authored the screenplay of Greg Zglinski’s film, Na swoje podobieństwo [In His Likeness] (2001) and, as a playwright, he has collaborated with Wojtek Klemm and Bartosz Szydłowski. He has also been published in, amongst others, the Gazeta Wyborcza, Tygodnik Powszechny, Ha!art, FA-art, Notatnik Teatralny and taz [die tageszeitung]. In his capacity as a reviewer, he has also worked on the television programmes Kinematograf (TVP1) and Czytelnia (TVP Kultura).